I’m sharing my super simple easy recipe for Bourbon Caramel Instant Pot Hot Chocolate. The perfect large batch recipe to share with family and friends. A few weeks ago I shared my recipe for Instant Pot Hot Chocolate. Today, I’m so excited to share with you my easy recipe for Bourbon Caramel Instant Pot Hot Chocolate. I shared this recipe back on Instagram last December, and have since wanted to share it on Katie’s Cucina; however, time got away from me! The time has officially arrived and I’m finally sharing with you my delicious recipe. Although it’s steadily staying in the 80’s here in Florida–others around the United States are experiencing yet another blizzard! So I felt like it might be fitting for others who are still very cold to warm up with a big glass (or pot for that matter) of Bourbon Caramel Instant Pot Hot Chocolate. 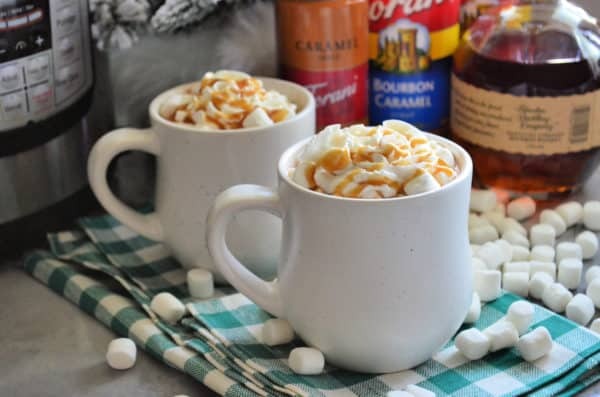 Is Bourbon Caramel Instant Pot Hot Chocolate gluten free? Technically, Yes! The brands I use are certified gluten free. However, always check the brands you use first. I use Nestle milk chocolate chips and Jett Puff Marshmallows. Both check out to be gluten free. As well as the Eagle Brand® Sweetened Condensed Milk. If your entertaining a group and someone has a gluten allergy or maybe just staying away from it altogether Instant Pot Hot Chocolate is a great option to serve. *Always, read labels of course! However, the boubon portion is a little questionable. “The National Institutes of Health and several major celiac societies in the United States say that distilled alcohol is considered gluten-free because the process of distillation removes the harmful gluten protein.” according to Very Well Fit. 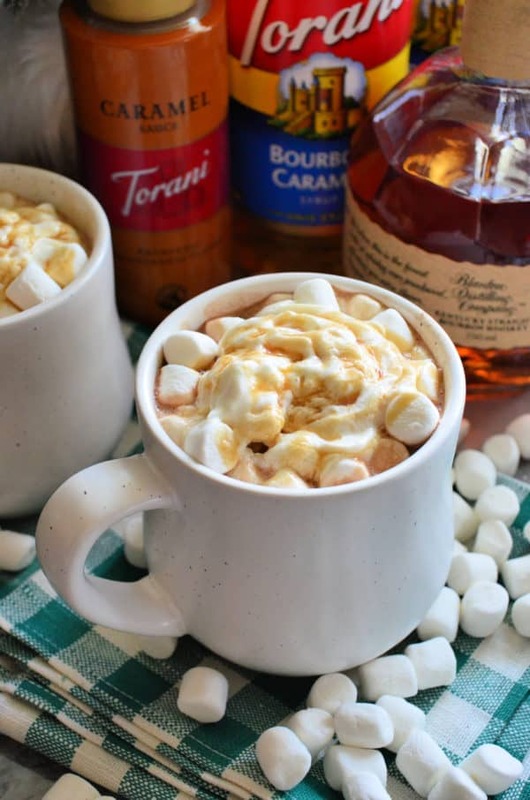 How do you make Bourbon Caramel Instant Pot Hot Chocolate? What toppings do you use for Hot Chocolate? I like to set out a wide variety of toppings for my friends and family to choose from. However, for this Bourbon Caramel Hot Chocolate I keep it relatively simple. Here is a list of my favorite toppings for this hot chocolate. I personally, like the traditional toppings of mini marshmallows, caramel sauce, and whipped cream. Whether your entertaining for a crowd or just want to make a big batch of hot chocolate to sip on throughout the day. 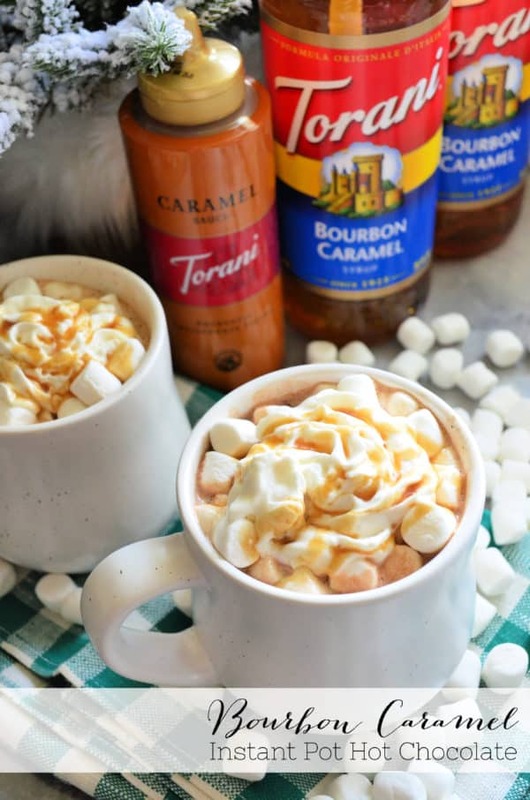 I think you’ll love my Bourbon Caramel Instant Pot Hot Chocolate recipe. Set the Instant Pot to "sauté" mode. Pour in the sweetened condensed milk, chocolate chip morsels, unsweetened cocoa powder, and the whole milk. Stir occasionally until everything has melted and smooth (about 15 minutes). Then, add in the Torani Bourbon Carmel Syrup and Bourbon. Turn off the Instant Pot and set to "keep warm" setting. Ladle hot chocolate into cups. 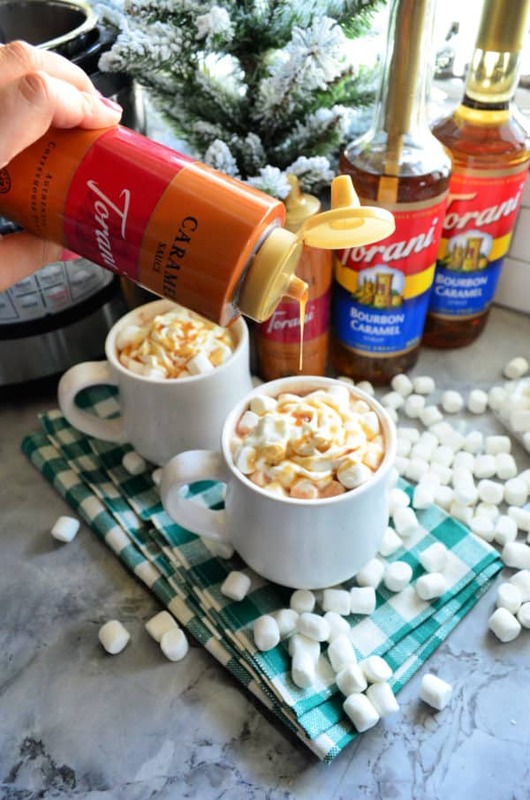 Top with mini marshmallows, whipped cream, and drizzle on the Torani Carmel Sauce. Enjoy!